I Skate, Therefore I Am: Street League end of year is great. Los Angeles, Calif – The inaugural year of the Street League DC Pro Tour Fueled by Monster Energy has come to an end, forever changing the face of competitive street skateboarding with an unprecedented $1.2MM in prize money distributed to twenty-four of the most elite professionals in the sport. With its proprietary format and Instant Scoring Experience™ technology, skaters, for the first time, had to utilize strategy in order to win and viewers knew exactly what place every skater was in, at every moment of the event. Each tour stop came down to the last two attempts with Nyjah Huston, Sean Malto, and Shane O’Neill battling the toughest competition in skateboarding history to each take home first place honors. In the concluding moments of the finale in Las Vegas, Street League Skateboarding™ creator, Rob Dyrdek, handed over the championship trophy to Nyjah Huston who won the overall series. 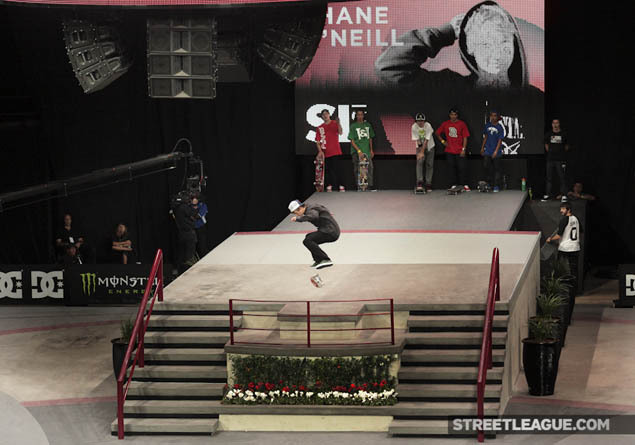 In its first year Street League has built a loyal audience of skate fans and non-skate fans alike, with more than 1.5 MM people tuning into the comprehensive coverage on ESPN2. With robust content on theberrics.com, international distribution in over 198 countries, and online re-airs on ESPN.com/action, the Street League DC Pro Tour Fueled by Monster Energy has already counted well over 400 million impressions worldwide. In stop one, Huston’s “kickflip out to frontside boardslide” on the kinked rail shot him into the top spot. O’Neill’s final trick of a “switch three sixty-flip” missed Nyjah by only one and one tenth of a point and fifteen year-old Huston grabbed his first win since the age of thirteen. In stop two, it was Chaz Ortiz who needed only two points to over-take Sean Malto on the last attempt of the contest. As Chaz fell to the ground on a missed “crooked grind” the crowd went ballistic and Malto took home $150,000. In the series finale, Chris Cole met a similar fate and missed his last attempt of the finals allowing Shane O’Neill to “backside lip-slide” his way to victory. By taking second place in the first stop, winning the Zumiez 24/7 award, and landing a league record of five best-trick bonuses ($5000 each); O’Neill’s Street League winnings-to-date stand at an outstanding $262,000 – making him the highest grossing pro in the historical series. Over the span of the three events, more than fifteen thousand fans filled the seats to witness their favorite skaters compete on real concrete skate plazas built inside an arena setting. The Jobing.com Arena in Glendale, AZ, the Citizen’s Business Bank Arena in Ontario, CA, and the Thomas & Mack Center in Las Vegas, NV were transformed by California Skateparks into authentic city-like skate plazas. All featured landscaping, beautifully designed concrete structures, and multi-color design patterns that raised the bar for professional sporting event aesthetics. For more information please visit http://www.streetleague.com/.